S5 Paradigm Shift - a universal template, running S5 Vertex framework and uses the latest technologies in web development. In the template, S5 Paradigm Shift 88 preset positions for modules, great menu module S5 Flex Menu and a large number of typographic styles. In the template, S5 Paradigm Shift no predefined color schemes, instead they have a very handy feature with which you can customize the color of any element of the website (titles, menus, hyperlinks, etc.). Template S5 Paradigm Shift supports extensions: K2, Virtuemart, Tienda and JComments. Also template S5 Paradigm Shift supports mobile devices. 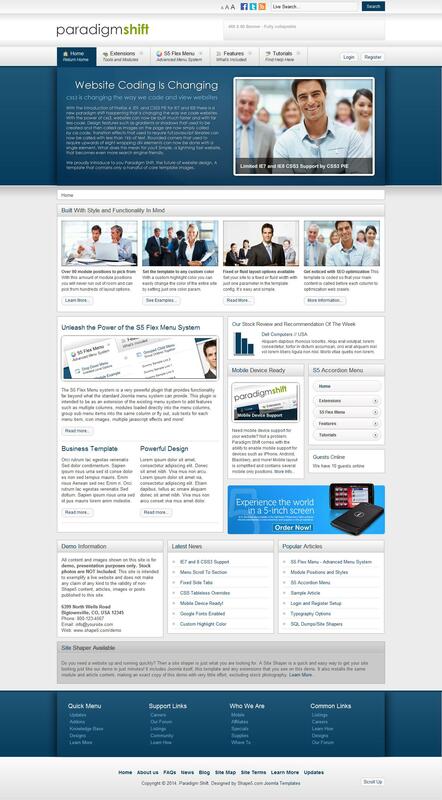 S5 Paradigm Shift - the perfect choice for business websites and various portals.